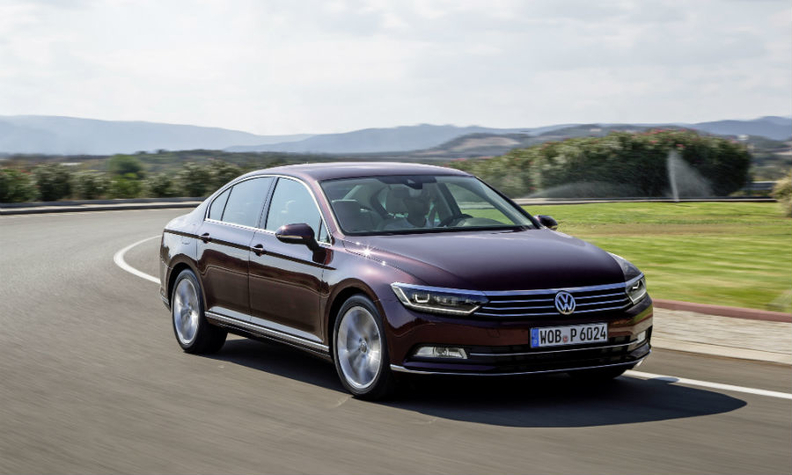 The new Passat, shown, helped to boost VW brand sales by 13% last month. (Bloomberg) -- European car-sales growth accelerated in February as signs of a strengthening economic expansion in the region, a global drop in fuel prices and dealer discounts encouraged purchases at Volkswagen, BMW and Renault. Registrations in the EU and EFTA markets climbed 7 percent from a year earlier to more than 958,100 vehicles, industry association ACEA, said in a statement today. Two-month deliveries rose 6.6 percent to just under 1.99 million cars, following January's 6.2 percent gain. Analysts said the growth may signal a stronger recovery of European car sales than the forecast 2 percent full-year increase. "The start of the year is clearly above expectations and gives confidence that market growth estimates could look conservative," said Sascha Gommel, a Frankfurt-based analyst at Commerzbank. "The overall economic outlook is looking up, and the ECB's interest-rate policy makes refinancing cheap and encourages car purchases." Juergen Pieper, a Frankfurt-based analyst at Bankhaus Metzler, said: "The growth is faster than expected, and the market may continue to increase about 5 percent this year. Better consumer confidence, the need to replace old vehicles and an improving economic development are helping car sales." Group sales at Volkswagen, Europe's biggest carmaker, jumped 11 percent last month, with increases of 23 percent at the Spanish brand Seat, which has been adding variants of the Leon compact, and 13 percent at the main VW nameplate, whose midsize Passat won the European Car of the Year award at the Geneva auto show in early March. Skoda sales were up 8 percent. Rebates by German car dealers widened in February, pushed by price cuts offered online, according to a study by the Center Automotive Research at the University Duisburg-Essen. VW Group models such as the VW Golf, Seat's Leon and the Skoda Rapid were discounted by as much as 30 percent by Internet dealers, researchers Ferdinand Dudenhoeffer and Karsten Neuberger wrote in the study. PSA/Peugeot-Citroen, Europe's second-biggest automaker, saw sales rise 1 percent as 4.1 percent growth at the Peugeot brand offset flat sales at Citroen. For Renault Group sales jumped 9.8 percent, boosted mainly by a 14 percent surge in sales of Renault branded cars, helped by demand for the Captur crossover, while registrations of its no-frills Dacia brand fell 0.5 percent during the same period. Fiat Chrysler Automobiles sales increased by 11 percent with the Fiat brand up 5.1 percent and Jeep sales tripling, helped by the new Renegade compact SUV. Opel and its sister brand Vauxhall sales rose 6 percent. Ford sales were up 6.8 percent. Among Asian brands, Nissan had the strongest growth with 27 percent growth. Toyota group sales rose by 7.1 percent. Hyundai brand sales were flat while sister brand Kia grew by 6 percent. Download PDF, above left, for February sales by automaker, brand and country. BMW's group European sales rose 16 percent as the the world's biggest maker of luxury cars, won customers with the 2-series Active Tourer compact minivan and renewed lineups of SUVs and Mini small cars. Daimler's registrations jumped 14 percent in the region, helped by new versions of its Smart city cars and the Mercedes-Benz C-class sedan and wagon. Car sales in Europe rose for 18 months in a row with growth in all major markets in February. The strongest gain was in Spain, where a government program encouraging trade-ins of old vehicles for scrap propelled a 26 percent surge. Sales jumped 13 percent in Italy and 12 percent in the UK, that country's 36th consecutive month of growth, with gains of 6.6 percent posted in Germany, Europe's largest economy, and 4.5 percent in France. ACEA is forecasting that new-car registrations this year will grow 2 percent to about 13 million vehicles, slowing from a 5.7 percent increase in 2014. Evercore ISI today said it expects car sales to increase by 3.5 percent.